Just back from 12 days in Morocco tucked in before Thanksgiving. I hadn’t been back for two years, and if I’d believed some press accounts, I would have expected to find a country straining to find its direction. 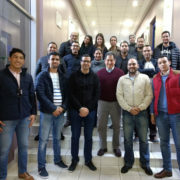 Yet after more than a dozen meetings, informal chats, and leading a graduate seminar for the Executive MBA program at Al-Akhawayn University in Ifrane (AUI), I can say that those who are overwrought about Morocco’s future should focus more on enabling than second-guessing its intentions. I have to admit that I’m lucky the in the reach of discussions that I had. People I spoke with came from the government, private sector, NGO and civil society communities, and specialized agencies, as well as the US embassy. There is a common thread of understanding that Morocco must do more, and an equally strong commitment to doing it right. Without surplus funds that bolster economic and fiscal policies in other countries, Morocco has to act decisively and in concert with the global investment community to fund ambitious projects ranging from transportation infrastructure and renewable energies to upgrading its public education system and creating sustainable jobs equitably. Arriving soon after the King’s Green March speech of November 6, I was struck by how strongly Moroccans supported His Majesty’s messages on territorial integrity, regionalization, and economic development initiatives. There is clearly a great deal of respect for the King, which may go a long way to explaining why there is more emphasis among people I spoke with on getting things done without waiting for the government. There continues to be a general lack of faith in many of the political parties (some 31 contested in the last election) and a concern that the House of Deputies is more a house of disputation than collaboration. I know, it sounds familiar…price of democracy some were saying…no rubber stamps in this process! The most common themes discussed were: Morocco’s intentions to fully develop the South (Western Sahara) and proceed with “deep” regionalization; concerns about the need for detailed implementation of regionalization, as well as more capacity-building for local officials, and guidelines describing the respective roles of the elected regional presidents and the walis (appointed by the King); the state of public education, which needs more resources and trained personnel; successes in the manufacturing and renewable resource sectors; and the overwhelming necessity to create more jobs without burdening the state. These are complex issues; often they overlap and are part of a larger challenge. Where should interventions be prioritized in the education sector in the short term to accelerate qualified job seekers? Do you start with those in the job market, upcoming graduates, dropouts, or those with experience and no degrees? All are concerns, and Morocco is trying to offer multifaceted responses. Another issue: I was told that middle class Moroccans are increasingly burdened by sending their children to private schools so that they can aspire to higher education abroad or at top schools in Morocco, several of which are English-speaking. This leads to a conundrum on several levels: how do you break the cultural perspective that everyone must have a university degree to be someone? How does one promote technical and vocational training as a path to a good-paying and respectable life? For those children who are qualified for higher education, what is the path to a quality program that rewards achievement and supports future schooling? Morocco is still struggling with issues regarding languages of instruction – Amazigh (Berber), Arabic, French, and English requirements are not yet clearly defined in school programs, a task made more complicated by the prioritizing of resources to the Amazigh program and by lack of qualified English teachers. Hopefully a new collaboration between AMIDEAST and the Minister of National Education will soon start certifying qualified English language instructors. Parliament is working on a number of critical bills to help facilitate business development through easier financing; enable broad judicial reforms throughout the system; and deal with thorny issues such as land registration and a national media protocol. It appeared from my brief observations that there is increased emphasis on basic economic and rights issues that are at the top of the country’s agenda. There are also discussions about changing regulations to allow more public-private partnerships, which requires revising current incentive guidelines. The much anticipated opening this December of Noor I, the flagship CSP solar power facility near Ourzazate, was obviously a hot topic, as it exemplifies the country’s commitment to renewables, which I heard repeated in numerous conversations. From ADEREE to the European Bank for Reconstruction and Development to several entrepreneurs looking for new venture opportunities, there is a buzz about how to leverage Morocco’s growth in renewables into hundreds of jobs in servicing installations both gigantic and household. This is clearly a growth sector throughout the country. I also want to say a few words about my students – all professionals in fields ranging from engineering to finance to administration, in the public and private sectors. Spending upwards of 12 hours a day with them renewed my confidence in Morocco’s future. They see their country’s shortcomings all too well, as they experience them daily. Yet they are determined, even when personally paying for the degree, to make a difference in their lives and their country. They are sacrificing a lot to become proficient in skills that are a stretch for those emerging from traditional educational systems. I want to acknowledge their hearts…strong and able to grow when challenged. If Morocco listens, it will hear the future in their voices. What’s at Stake in 2015 for Morocco? Opening the Door to Community Activism – Will Moroccan-Americans Respond? What’s All the Fuss about in the Sahara?